1. Saute onion in oil until soft. Stir in chilies and shredded pork, cook until meat is hot. Stir in tomato, cook 1 minute. 2. Brush tortillas lightly with vegetable oil. Heat in microwave or in oven. Place 1 tablespoon filling in a narrow strip 1 inch from the edge of each tortilla. Roll up tightly. Fasten in center with a wooden pick. 3. Pour oil 1/2 inch deep into a medium skillet. Oil must be hot enough for tacos to sizzle when you place them into the skillet. Fry several taquitos at a time until crisp. Drain on paper towels. Remove wooden picks. 4. Serve immediately with guacamole for dipping. 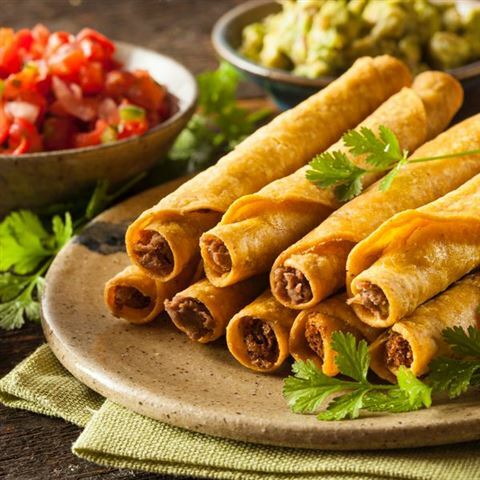 Taquitos may be cut in half for easier dipping. 5. To freeze: refrigerate taquitos about 1 hour after frying. Wrap 10-12 taquitos in heavy foil or freezer wrap. Store in freezer and use within 2 months. 6. To serve frozen taquitos, remove from freezer, unwrap and place in a baking dish. Cover lightly with foil. Bake in preheated 350 degree F oven 20-30 minutes, or until heated through. Enjoy this delicious pork taquitos with guacamole Mexican recipe! Great recipe!! I made these for the Super Bowel, and my family ate them up! Thanks for the recipe!